Just take a look below at a few of the NatureZway products I have incorporated in my household. And, before I forget – right now, you can get 15% off! Just head over to Amazon and use discount code: GoGreen15 at checkout. I am loving these NatureZway products! Want to learn more about these fabulous products? Not only is Bamboo bath tissue super strong and absorbent, but it is also healthy for the Earth! The bath tissue is made of 100% bamboo fiber and is 100% BPA free, biodegradable and made with no recycled material. This Bamboo Bath Tissue features 320 sheets per roll. Stop going through paper towels like mad that you have to throw away with these reusable Bamboo Perforated Towels! These towels are super absorbent and durable, safe for use on all surfaces, can be reused up to 100 times and they are washable! The perforated towels are made with renewable sustainable sources which help save trees. Each roll has 25 sheets. You will love the amazing bamboo reusable cloth! It is soft, non-scratch and safe to use on any surface, It is also super absorbent, machine washable and lasts longer than other towels. If you like to use a sponge for your cleaning needs then you are going to love this eco-friendly sponge made from plant-based materials! It is perfect to use in the kitchen and for bathroom surfaces such as stove top, dishes and more. It is super absorbent and safe for use on all surfaces – will not scratch! Plus, it lasts much longer than foam sponges. The best part of all is that it is machine washable! Use the NatureZway Bamboo Vegetable Brush to keep your kitchen neat and tidy. It is made with natural bamboo and the bristles are made of Tampico plant. This is important because it provides greater water absorption than plastic bristles. The absorbent bristles have an ergonomic handle that is user-friendly so you properly clean. What do you think? Easy, right? Are you ready to become more a more eco-friendly household? Head on over to Amazon to shop and remember to use discount code: GoGreen15 at checkout to receive 15% off your order! I like the fact that the products are eco-friendly and chemical free. I would love to try bamboo products. I do like that the Bamboo Vegetable Brush has Natural Fiber Bristles. We could really use this for all the vegetables we eat. These eco-friendly products would be great for my upcoming Spring cleaning. Chemical Free products are the best choice for my household. I would like to try all of these products. It would be great to win this prize pack since it is natural and just in time for my Spring cleaning! I really wanna try the sponge I am the only one that does dishes in my home and I need a good one! The NatureZway’s Pet Waste Bags would be handy to have and use. I didn’t know they sell those also. Wonderful! Thanks so much for you’re web site and informative great products that are good for us and our home! The sponge sounds amazing to use in the kitchen. I have never tried products made from bamboo. These sound like amazing products! We are trying to get into more natural cleaning ways. I think the Sponge – Rayon Cover made from Bamboo – 2 pack would be really useful to use in my bathroom. These look like some nice eco frinedly products. I would love the chance to try them out in my home. Protecting the environment and people while providing a quality product. That is a great and admirable solution. I’d love to try these cleaning products, especially the All Purpose Cleaning Cloth and sponge. The Bamboo Sponge – reusable and washable – 2 pack, would be very helpful in my kitchen. So terrific that these are washable. Thanks for the 15% offf code! Looking forward to trying NatureZway out! I am loving these useful products and wanting them! This is a great green giveaway! Thank you for the opportunity! I like all these products since they are eco-friendly. I have not had the pleasure of trying any made of bamboo. Love all the products made out of bamboo and that they are panda and earth friendly. I can feel good about using these products in my home. I love products made from bamboo. These all sound great! The Bamboo Perforated Towels would be so useful in my kitchen. These sound like great products! I would love to try out the Bamboo Perforated Towels and the Vegetable Brush most of all! I would like to try this selection of different cleaning products. They look great. These products sound great since I am all about eco-friendly. I would use them all and really excited about using the sponge in the kitchen. I love that these are natural. Very nice products! Eco-Friendly Cleaning Products like these are worth it to try! I like chemical free products. I thought that I was doing my part by rinsing out the recyclable items and then recycling them. But as your review pointed out, I could be doing more. I’ve been hearing more about bamboo products. Now I know why. I wasn’t aware of these bamboo paper products. I pinned this and hope more people become more aware too. I like more absorbent paper towels to handle our spills! Thank you for sharing! I love that the Bamboo Perforated Towels are reusable and washable! That’s awesome! The discount code sounds like a great deal. I would love to try these products. These products are such a good alternative for cleaning and I really like that the towels are reusable. These products sound amazing, I want to try them all! I love using eco-friendly products and am always looking for new ones to try. Thank you so much for sharing! I think the Sponge – Rayon Cover made from Bamboo – 2 pack would be super to use. These sound like great and practical products. I’m a believer in bamboo. I have bamboo floors and would love everything else bamboo too. As far as paper towels go 100 times more absorbent is plenty good enough for me. I only use eco-friendly, non-toxic cleaning products in my home, so I am super excited to learn about this. These products look wonderful. The Bamboo Perforated Towels sound awesome! These sound like great products. I have been trying to use more eco friendly household items. This brand sounds so nice! I like the sponges. 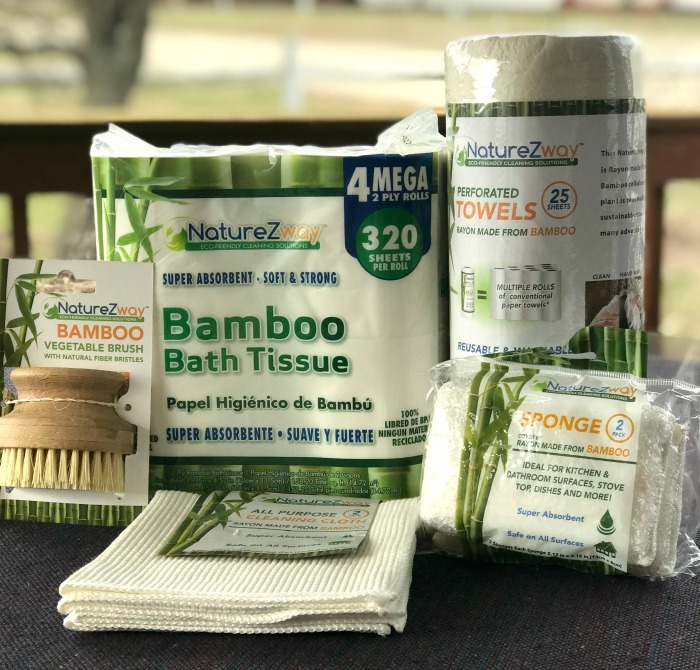 These bamboo products sounds wonderful and definitely a plus in helping cleaning the house and also I love that you saving trees. 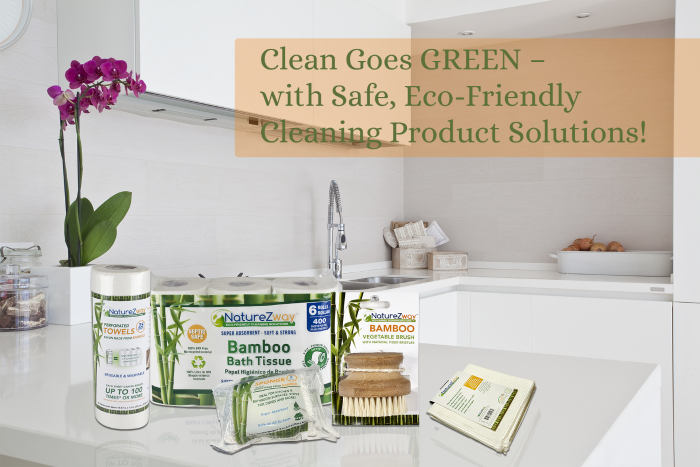 NatureZway Safe, Eco-Friendly Cleaning Product Solutions would be perfect for my home. All these products seem super to try. These products sound wonderful! and I love that they are made from bamboo, such a wonderful product to use to help clean your home with. I really like that cloth and scrubber.